The premise is a simple one: what smoky "black powder substitute" is the better choice for today's inline muzzleloaders? The bulk of this specific shooting and testing was performed over a three day period. The selected muzzleloader was an Encore Pro-Hunter, the bullet a 250 grain .452 Hornady XTP married to an MMP "3 Petal E-Z" sabot. The primers used were all Winchester Triple Se7en primers. The range conditions were 65 - 72 degrees, at 500 feet above sea level. The testing was focused on sulfurless blackpowder substitutes, all promised to be less corrosive than blackpowder with "water only clean-up." I procured not one, but two CED Millennium Chronographs to capture the velocity data-- Boy Scout's Motto, I suppose. The CED chronographs are best and the most accurate chronographs readily available today. When volumetric powder measuring was required, I used the same T/C U-View powder measure for all propellants, never moving it from the 100 grain hash-mark. Currently on the market are two broad sub-classes of sulfurless propellants: Hodgdon's Triple Se7en (2002) based on gluconic acid, and Black Mag 3, Pinnacle, American Pioneer / Shockey's Gold-- all ascorbic acid based propellants. There are somewhat colorful histories behind all the ascorbic acid propellants. Another way to categorize blackpowder substitutes is how they are managed shot to shot. With properly fitting sabots, blackpowder, Pyrodex, and Triple Se7en all require spit-patching between shots. As few owners' manuals bother to tell new shooters the procedure, I'll touch on it now. To insure consistent bore conditions, you need to fire a fouling shot. Please, not a 'fowling" shot. Fowling is for the birds, literally. "Fowling" pieces are another way of describing blackpowder shotguns used for waterfowl, and so forth. Fowling has nothing to do with modern inline rifles at all. When using sabots, you have a supply of .50 caliber cotton patches with you. After each shot, you lick a patch using saliva. The moistened patch goes on the end of your jag, moisture side out. Now, your ramrod and jag are moved down the bore in stutter-strokes. You go up and down, up and down, going a bit deeper with each up and down motion until the breech-plug stops you. Your ramrod / jag / patch is withdrawn, the patch flipped over, and the process is repeated. 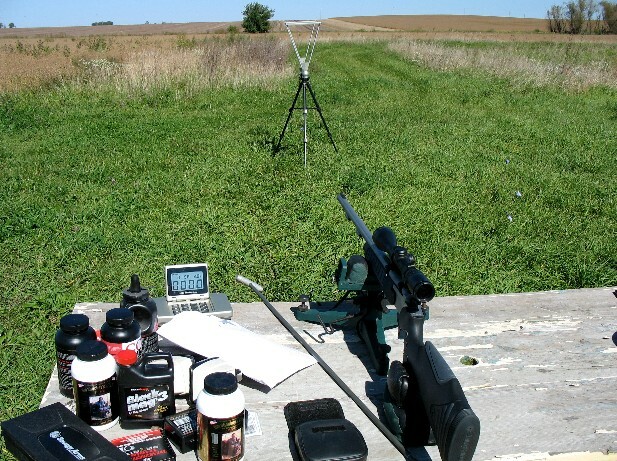 This is the only way to insure consistent bore conditions and resultant shot to shot accuracy, and is the proper method for sabots when using blackpowder, Pyrodex, and Triple Se7en. Conicals are a different matter. Horribly undersized conicals do not need spit-patching between shots. That's why Capt. Minie (or W. W. Greener, if you prefer) developed the "Minie-Ball"-- not a ball at all, but a conical. In the Civil War, supreme accuracy was hardly as important as reloading your rifle when there is a hail of bullets coming at you from across the pasture. Unloaded gun have never fared all that well on the battlefield. So, the no-swab approach is as old as the hills. Doc White analyzed and exploited that in more recent times, using slip-fit heavy conicals with comparatively clean-burning (smaller granulation) Pyrodex-P, though Doc certainly has developed and hunted with sabots as well. So, the no-swab approach is far from new, nor is the ascorbic acid based Clean-Shot (now reappearing as APP) or the old Black Mag 2 or Black Mag 3. The residue from these ascorbic acid propellants is primarily potash. To have any luck with them, you need to start with a clean and dry barrel-bullet lubes and oil cause problems. A film of oil will drag the potash out of the hot gas, and clumping of residue in your barrel is the result. The vitamin C burners generate a small amount of water when burning. So, the procedure is to fire a fouling shot and then just keep loading and shooting. There is a small amount of grit in your barrel, but not much, and it accumulates at a very slow rate. You will likely have better results with a slightly loose fitting sabot on your first shot, and then the grit offers proper seating resistance for subsequent shots. So, how you wish to quantify these propellants is your choice. Sulfur or sulfur-less is one way, swab or no-swab with sabots is another, and pre-measured (pellets or sticks) or loose powder is yet another. All are reasonable ways at separating the respective propellant classes. Moving along, let's take a closer look at some of the tested propellants. Going back a bit, "Clean Shot Technologies" had their stuff on the market for a while. It gained a reputation as an aggressive moisture-sucker with fairly low velocities, but had a bit of a following in low-humidity areas for a time. Clean Shot Technologies made the mistake of infringing on Hodgdon's pellet patent. Hodgdon complained about the theft of their intellectual property, the courts agreed, and Clean Shot was no more. It is fair to say that Clean Shot was a fairly peculiar company, with sales offices in Florida, and leased production equipment in Colorado. Hodgdon had to find that out the hard way-- Clean Shot had very little in the way of tangible assets. Re-organized under the name "American Pioneer," CST has gained a very poor reputation in the industry-- but, for better or worse, they are back. The results with Shockey's Gold were poor. Though American Pioneer claims a lot of things, including that Shockey's Gold is a "premium grade version" of American Pioneer, the only thing tangible that I have been able to detect is the different label on the bottle. The Shockey's Gold sticks are still clumsily packaged in a bottle with plastic beads, and are irregular in size and shape-- I've had bags of charcoal briquettes with better quality control. Some of the sticks shaved off parts of themselves going down the muzzle of the Encore, some didn't. A casual look at them shows how crudely made they are, with chips, cracks, and other very rough surface irregularities. This is cobby stuff, to be sure. As for performance with my Pro-Hunter, it was decidedly inconsistent. With the 250 grain Hornady XTP and MMP 3 Petal EZ sabot, a typical three shot string was 1695 fps, 1773 fps, and then 1598 fps through the CED Millennium. This is the same type of low velocity and wild shot to shot deviation I saw with American Pioneer tested last year in a different Encore and a Knight Disc Elite using 300 grain lead saboted bullets, among others. Jim Shockey and I have talked about this stuff a bit, and I don't doubt for a Mexican minute that this is the stuff he hunts with. At the typically close ranges Jim hunts at, inconsistent velocities at the muzzle, even as bad as this stuff is, is unlikely to change the outcome. Those with nothing better to do can attempt to make out of this anything they will-- but I happen to like Jim Shockey; folks will just have to get over it. Jim doesn't make this stuff, has no hand in the quality control, and doesn't bother with chronographs. I could no more complain to Jim Shockey than I would send hate-mail to Irlene Mandrell if I got a bad CZ. Like APP and Pinnacle, if used sans lube, it is clean. There was a small amount of crud that formed at the end of the T/C QLA, and some minor amount of crud near the breechplug. It is easy enough to push through, and from shot to shot no swabbing was ever used, or is necessary. As final, vivid testimony to the moisture attracting propensity of Shockey's Gold, the gravelly mis-named "FFg" loose powder and the "FFFg" loose powder are packed with desiccant packets, if that tells you anything. Due to the low, extremely inconsistent velocities and obviously deficient quality control, I would not bother to trust a hunt to this stuff. Pinnacle has been reviewed elsewhere, and is closely related to American Pioneer-- it should be, as it is made by American Pioneer using the same packaging methods and exhibits the same crude quality control, the same gravel-sized "FFg" granulation, and so forth. There is something quite disturbing to me about a so-called manufacturer of a product that has no clue how to use it. Goex sells their APP manufactured sticks as "E-Z Loads." Amazingly, right on their website, Goex instructs you to, "Just drop the pre-measured charge down the barrel of your gun and use the ramrod to pulverize it." Good grief. The notion of taking a pellet or stick, first loading it as a unit, then using your ramrod to stick it, stab at it, and "pulverize it" is bizarre. Of all the nonsense spouted in muzzleloading, this one ranks quite high on the list. One of the few things that has remained true is that accuracy and consistency are synonyms. If I reported the Pinnacle "E-Z Load" results used as directed by Goex, it would be categorized as the worst blackpowder substitute ever offered to the muzzleloading community. You certainly not only do nor crack or break pellets, you take reasonable care to avoid it. If this was reasonable at all, you'd have to wonder why both .45 caliber and .50 caliber E-Z loads are even made. If you are going to pulverize this material, well-only offer .45 caliber sticks. At least that way you wouldn't be shaving off propellant outside the barrel. Dust is dust. Not destroying pellets is really old news. The stuff that could really use some pulverizing is the "FFg" by Pinnacle or American Pioneer-- but it should be properly granulated before you buy it, not after. I have no particular explanation for this, but I did open one bottle of Pinnacle E-Z loads that actually was consistent-- recording velocity strings like 1805 fps, 1835 fps, 1819 fps, and 1804 fps. If it was all like that, it could be worth using. But, the good results were short-lived, sinking back into the same erratic velocities as recorded by Shockey's Gold, prior Pinnacle testing, and American Pioneer-- if at marginally better velocities. If you really feel you need to use this stuff, actual weighed charges of FFFg is your best chance at getting a usable field powder-- the same goes for the other APP produced compounds, American Pioneer and Shockey's Gold. You sure need to burn a lot of it to get any semblance of good velocity, though. All of these powders seem to have stories behind them. Mag-Kor's "Black Mag 3" is no exception. The coarser Black Mag 2 and Black Mag 3 introduced in 1995-1996 vanished from the marketplace for reasons I'm not aware of, for some time. When it reappeared, I was of course looking forward to trying it. Well, a sample was hand-carried over to my house by a local distributor. I never did review it, and I'm happy to tell you why. My "factory fresh" sample could not be removed from the bottle. The bottle was swelled, and the 'powder' was one hard, solid, one pound mass. Despite promises that it would easily break up, mine sure wouldn't. It was jabbed, stabbed, crushed, and hurled against concrete-- more than I recommend anyone do with an impact sensitive propellant. Yet, it remained a lifeless, sordid, one pound solid plug of junk. Okay, things happen. Despite numerous calls to Mag-Kor as well as the local distributor, there was no interest in addressing anything. All I could glean from the conversations was that this was a fairly common problem, and I wasn't the first to get a useless blocky mass. Much later, I learned that the "packager" had neglected to follow procedure, and that the matter was subject of some litigation. In the interim, Black Mag 3 appeared for sale by Cabela's; then it was discontinued by them a short while later at the fairly rich price, if memory serves, of $25 a pound. Between that, and a few friends who were able to remove some out of their bottles yet experienced erratic results, I decided to leave Black Mag 3 to the internment of merciful time. Things changed, though. Dennis Dudley and his shooting team tried Black Mag 3 earlier this year, and had outstanding results. So much so, that Black Mag 3 was their powder of choice at Friendship. So, I did decide to revisit Black Mag. I was able to get a hold of a few pounds, and to my surprise-- it came out of the bottle. The current Black Mag 3 was granulated nicely, and metered without a hitch. Out of the Encore, using 100 grain volumetric loads, it did beautifully. Velocities ranged from 1815 to 1834 fps through the CED, and if anything-it is cleaner than the APP variants, with far better velocities. This batch was virtually the ballistic twin of Triple Se7en, without the requisite spit-patching between shots. It was easily the most pleasant surprise of the test. The current Black Mag 3 performed superbly; but that raises a whole new set of questions. I have no idea where to get it locally; distribution and availability seems to be a huge problem all over the place. Even Mag-Kor doesn't seem to have much idea where to get it in most locations. It seems to be popular in Virginia, but for most of the rest of the country-- trying to find it is quite a chore. I'm far better at foretelling the past than predicting the future-- but this powder is impressive. Whether Mag-Kor can repair their sullied reputation and get adequate distribution is another matter entirely. If you can get a hold of some, it is well worth your personal evaluation. It was the cleanest, most consistent propellant tested with velocities as good as the best, and better than the rest. Triple Se7en, as most folks know, took the marketplace by storm starting in 2002. I've hunted with both Triple Se7en powder and pellets successfully, and have burned more pounds of it than I care to think about. Although I received an e-mail direct from Hodgdon a long while ago insisting that the infamous "T7 crud ring" does not exist, everyone knows by now that it does. Enough breechplug changes have been made in attempt to address the problem that the T7 crud ring is a known issue. Olin's T7 209 primers have done a good job in reducing, but not completing eliminating Triple Se7en's hard, slag-like fouling crud. With Triple Se7en, it is spit-patch between every shot though certainly a quick reload in the field of one sabot is no issue. The Triple Se7en "100 grain equivalent" of two pellets averaged 1833 fps through the CED, with shot to shot deviations of only 10 fps or less. Triple Seven FFg loose powder averaged 1837 fps, all shots falling within a 20 fps range. As a side note, I've not found three pellet T7 loads to be as accurate as two pellet loads as a generalization-- actually getting better consistency from Pyrodex pellets. My preference is actually for weighed charges of Triple Se7en. It is far easier to work up a load this way-just starting at 90 grains by volume in a new rifle, and increasing in 5 grain volumetric increments until accuracy starts to fade. Then, it is a matter of weighing the volumetric charge you've decided on, and duplicating that charge by actual weight. With weighed charges, I've been able to get shot to shot deviations down below 10 fps. In some cases, the talking chronograph registers properly-- then gives the identical velocity. The subject of corrosivity comes up from time to time, and as far as I'm concerned-- all of these propellants are corrosive, though markedly less so than blackpowder or Pyrodex. Sulfur salts have long been the main culprit. Once in a while, the topic of "seasoning a barrel" comes up. Anyone with a basic understanding of modern steels realizes that they are non-porous compared to a cast-iron skillet, and they cannot be seasoned one way or another. One can long for the return of primitive metallurgy and the return of Damascus barrels with porous welds on twisted steel, but I'm not one of them. Your local Ryerson's can educate you on the properties of modern steels, if you have any real interest. The ascorbic acid based propellants aggressively attack and corrode brass. My impression is that they are somewhat less corrosive than Triple Se7en to barrels, but I'm not willing to intentionally ruin any rifle barrels to find out. The gluconic acid salts and alkali metal nitrobenzoate salt based Triple Se7en, with some carbon added to give it a little color, remains the best available solution for today's modern muzzleloaders that cannot use better, less smoky, non-corrosive propellants like the Savage 10ML-II can. The Black Mag 3, as tested, holds the most promise as competition to Triple Se7en, but availability may be a hurdle. Based on this set of tests, Black Mag 3 won the day. So, for now, Triple Se7en remains the most readily available solution. Hopefully, by now, most muzzleloaders understand that all guns are individuals, it is the shooter's responsibility to work up a load, and if there are any questions as to the suitability or amount of a propellant-- the manufacturer of the rifle alone can tell you what is allowed and what is not. If you are in the mood to try a new powder, particularly if your breechplug is extremely filthy, or if T7 is hard to ignite for you-- I'd say Black Mag 3 is well worth your time to investigate.